Bashir Algamar was born in Sudan in 1955. He came to England as a political refugee in 1993 after being imprisoned for his poem: Patience on a beach. Since then he has lived in Brighton. 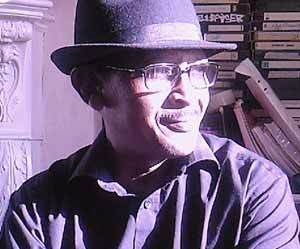 Bashir is a poet, songwriter and composer. Since 1991 he has written and composed more than 40 poems and songs, mainly in Arabic. Most of them are well known in his home country, Sudan. Some of his songs have been recorded by Sudanese National TV and radio. At present he is working on a new collection of poetry, entitled: “Rhythm and resonance”. He is also planning to perform his poetry in several countries with a Sudanese singer. Bashir has taken part in several art exhibitions and poetry readings in England: in Cardiff, London, Liverpool and Bristol. He is also a well-known proponent of the “Oud”: an oriental musical string instrument. His poetry deals mainly with his homeland, exile, human suffering and love. It is written either in classical Arabic or in Sudanese local dialogue. The poems contain many emotions, images and metaphors; and are written in a musical and rhythmic language. Suddenly the world plunges into darkness and destruction. a faint moaning wail from the midst of the wreckage. You follow it with eagerness. they have breathed their last asleep. a few moments ago, she was here. cast beside an unexploded bomb. the doll who gave you endless joy. You combed her hair, talked to her. This you will never understand. your small head cannot grasp it. Where is your mother’s head? Where are your father’s remains? are etched in an innocent memory. The terrible odour of death chokes you. Carrying your doll, you run away. witness to a minor tragedy. are burnt into the little girl’s memory. belongs to those who give it. No borders, no passports are needed. angry when we become greedy. crying a torrent of tears. she shakes into an earthquake. we pushed our mother earth to destruction. Huda Ghaliya: a 7 year-old Palestinian girl who lost her entire family to an Israeli missile while picnicking on the beach.